It was a gamble. Perhaps calculated, perhaps not. It was also a snub. And it failed — helping to sow the seeds of Climategate. CLIMATE SKEPTICS: NOW YOU SEE ‘EM, NOW YOU DON’T! 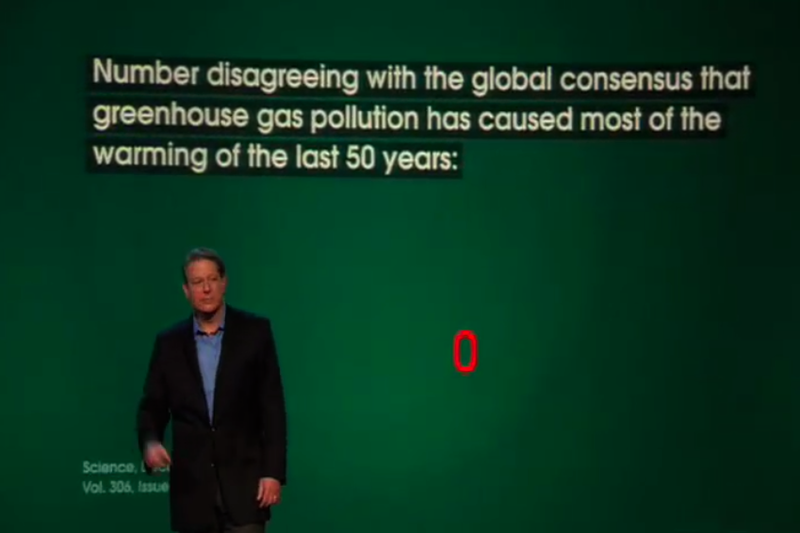 Gore symbolically dismissed the ENTIRE climate skeptic movement in his movie in this one scene that cited 928 climate papers affirming human-caused global warming, then said zero papers disagree with this “consensus.” It came from Naomi Oreskes Science paper. Certainly the substance of what he said was true. But the style of delivery sent a condescending, dismissive message to the already-enormous climate skeptic movement that “you don’t even deserve to be recognized.” Which might have been fine had they been a trivial group of crackpots. But they weren’t, as they forcefully showed with Climategate. And thus it failed as a tactic. Given the sad, flaccid atmosphere lingering around the Cancun climate talks this week (Andy Revkin tells about how the Japanese, who once upon a time hosted the Kyoto meeting that started things, are now the biggest party poopers) it seems like a bad time to talk critically of Al Gore’s effort, but this stuff is important so I ask you to keep your mind open. Let’s start with a quote from one of the most popular books on storytelling in recent years, “The Story Factor,” by Annette Simmons. She says, “Demonizing the other side sets up a lack of mutual respect that prevents your story from being heard.” Or, in other words, “respect your opponent.” These are words to live by. That’s not what I have complained about. I’m talking about the critical assessment of how effectively the movie achieved it’s goals of awareness and persuasion. I’m talking about assessing “what worked and what didn’t work” about the film as an exercise in the mass communication of a major piece of science. Earlier this year I praised the movie for accomplishing so much in raising awareness of the issue, and more recently I’ve been doubling the praise for the fact that “AT LEAST THEY DID SOMETHING,” in terms of their having taken a bold chance by even making the movie (i.e. it was people DOING something instead of just sitting on blogs and talking about doing something). The people behind it are forever to be applauded for their courage. But that said, I have also criticized the movie for being a boring, maudlin, piece of exposition that failed to tell a good story that would make people enjoy repeated viewings. However, there was one very important element I’ve so far left out of my critique which I want to examine in detail now. There was a key moment in the movie which I feel is historically important as it became a major piece of leadership from Al Gore. It was the main point in the movie when he addressed the issue of climate skeptics. Yes, the substance of that statement is completely accurate. But let’s talk about the STYLE. It was dismissive. As a gesture, it was equivalent to sweeping aside the entire climate skeptic movement — deeming them trivial and irrelevant. Which would have been fine had they been nothing more than a bunch of kooks with the same scale of resources as 9/11 conspiracists, Obama birth certificate fanatics, JFK assassination nutballs or even Holocaust deniers. But they weren’t, as you can see below. Do you remember in 2004 when John Kerry addressed the Swift Boat Veterans controversy by deciding to ignore it in hopes that it would simply fade away? Do you remember in 1988 when Michael Dukakis tried to ignore the Willie Horton commercial and the vicious assault masterminded by Lee Atwater (btw, if you haven’t seen the 2008 documentary, “Boogey Man: The Lee Atwater Story,” it is one of the most gripping documentaries in recent years). Gore sent out the same signal with this scene in his movie — the idea of, “Ignore ’em and they’ll go away.” But they didn’t. By 2007, when I was shooting my movie, “Sizzle,” I found it frustrating that none of the major environmental groups would show any guts and actually confront the skeptics. 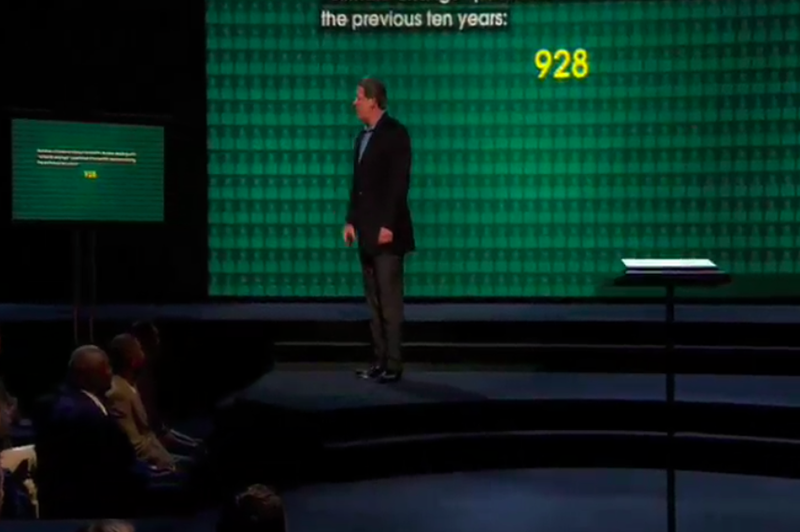 Which was why I was relieved on March 18, 2009 when I received a mass email from Sam Parry of Environmental Defense Fund titled, “By the Numbers,” in which he FINALLY showed numerically how massive the resources of climate skeptics had become. THIS IS HOW FORMIDABLE THE CLIMATE SKEPTICS HAD BECOME BY MARCH 18, 2009. 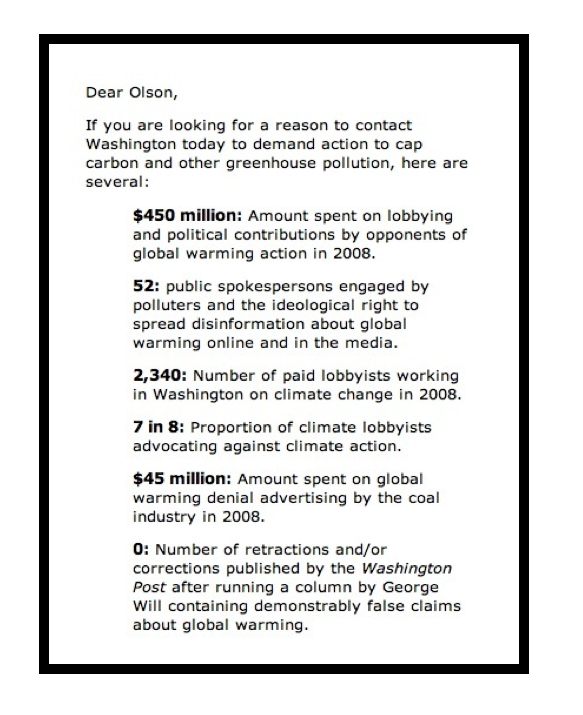 This is from a mass email sent out by Sam Parry of Environmental Defense Fund. I found it to be a breath of fresh air that finally an environmental group was willing to go the opposite direction of Gore. Rather than attempting the failed, “ignore them and hope they’ll go away” strategy, this was an effort to get the public to realize, “THESE FOLKS ARE SERIOUS AND ARE NOT GOING AWAY.” This email was essentially sounding the alarm a few months before Climategate, but it was an alarm that went largely unheeded. (btw, I’ve always loved that EDF has me in their files only by my last name, so that their phony personal greeting reads, “Dear Olson,” which has all the charm of, “Hey You”). More importantly, you saw the major environmental groups involved with global warming simply turning a blind eye to this significant opposition force. There existed an opponent, but no one wanted to look them in their eyes. I was amazed in 2007 that virtually no one had been to see some of the major climate skeptics (Singer, Michaels, Morano, Hayward, Gray) to interview them for a film previous to me. There was just a big campaign to “ignore them and they will go away.” Aside from Naomi Oreskes (ironically the source of the numbers Gore cited) who was engaged in direct and blunt combat with them, no one seemed to be taking them on through any sort of mass media. By 2008 when I released the film I began to get blowback from people at scientific institutions where we wanted to show the movie. Many said they believed there “is no debate,” and simply didn’t want to support a movie that suggested there is. And then there was Climategate. Literally overnight the, “there is no debate,” voice vanished. The science and environmental communities finally learned there is a debate — not through effective leadership and communication, but by having their noses shoved in it. Sorry. This is history. It’s important that it be talked about and examined. It’s called “trial and error.” It’s how you get smarter. “An Inconvenient Truth,” made a lot of good and important contributions to the topic of global warming, and it made some mistakes. There continues to need to be in-depth examination and discussion of both. Why? Because it is the ONLY significant piece of mass communication of global warming to date. It’s the only brave effort to address this enormous topic. It needs to be a source of learning, and not just swept into the past — ESPECIALLY when Japan says they are quitting the climate stuff because the two leading carbon emitters, the U.S. and China, are not showing any leadership.